Your pet will be more comfortable eating from an elevated position because they won’t have to stoop over as much. 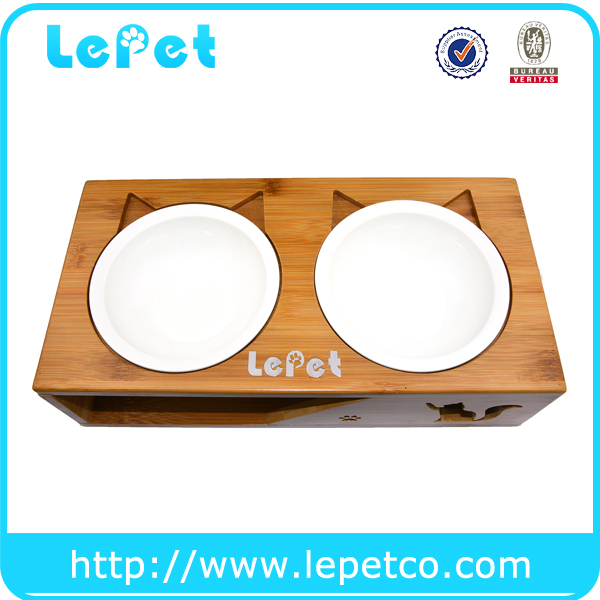 Not only will eating from this raised pet bowl be more comfortable, but it will also improve your pet’s digestion. Keeping your pet’s posture aligned while eating will help food travel down your pet’s esophagus. 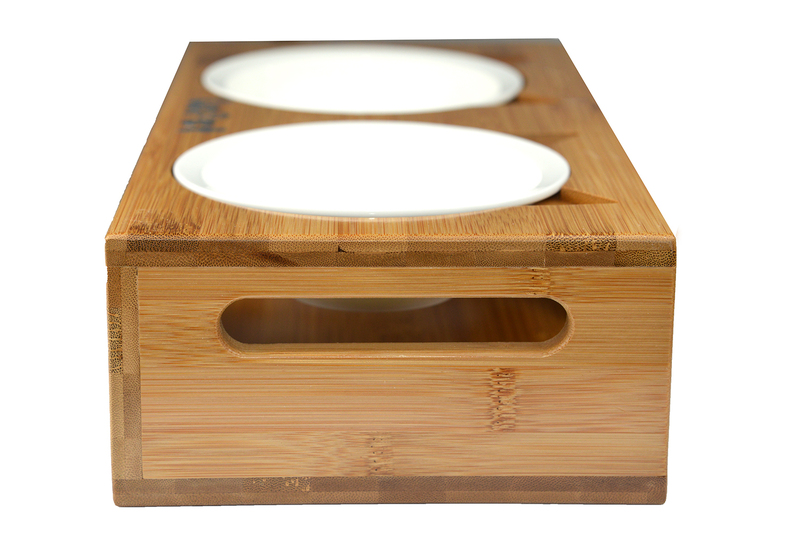 Made from bamboo which is known for its high water resistant qualities. 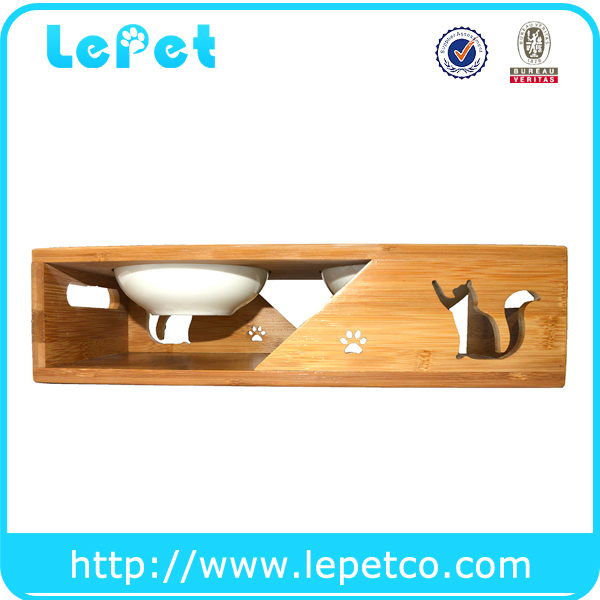 If you have a dog or cat that is a messy drinker, you do not need to worry about this feeder warping or cracking. Sturdy design with no moving parts means this feeder will be the last great feeder that you will buy. Included a beautiful pair of Ceramics bowls which is easy to clean. Raised pet feeders allow your dog or cat to have a healthy posture while eating which helps improve your pet's digestive health. 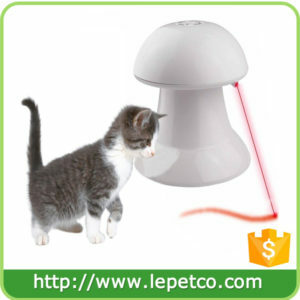 This feeder measures 3.6" high which is perfect for your cat or small dog. Pet bowls keep food off the floor since moisture underneath pet bowls is a great place for bacteria and mold to grow. 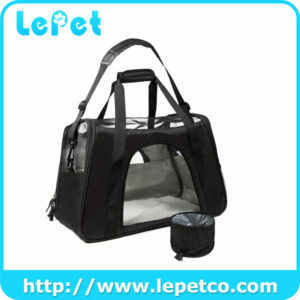 Two removable bowls allow you to fill your pet's food and water bowls without moving the whole unit. This cat ear shape pet bowl stand is well made with no moving or detachable parts so it will be forever sturdy and fit in nicely with your home decor. 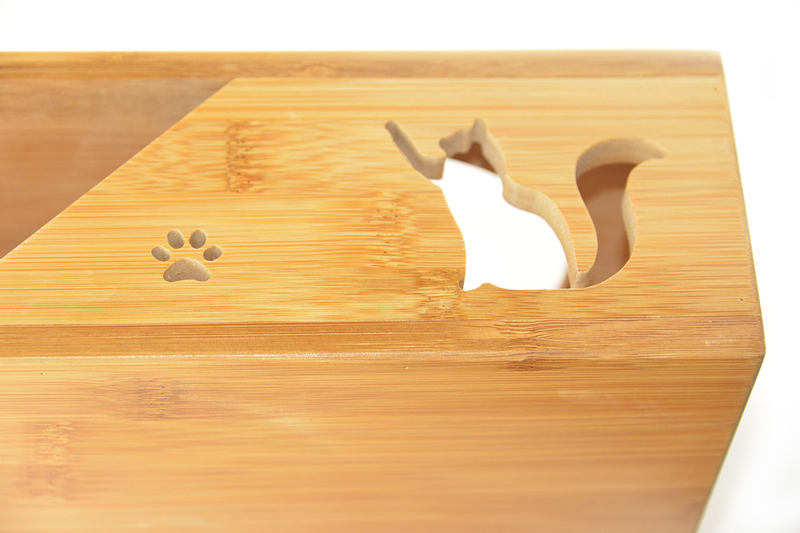 Pet bowls are secured inside the bamboo stand and anti-slip feet prevent your pet from sliding his bowl around and damaging your expensive floors. Beautiful design, available in gorgeous shape, our raised dog bowls are a seamless addition to any room's décor! 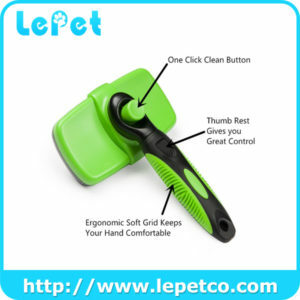 Easy to carry with the handle on each side. The included bowls measure 1.77" deep and hold 1.25 cups but can be interchanged with bowls of your choosing with a diameter of 5.4 inches. Safe for Pets, curious pups will chew just about anything. But unlike most other feeders, our cat and dog food bowls are non-toxic, eco-friendly. The stains and finishes are all natural, making these family-safe stands gluten and allergen free.